Jeff Watts of the Watts Atelier is another Youtube channel to bookmark. Their Friday Night Workshop videos are an incredible resource and free to watch. This video is one of their shorter pieces, a fun holiday tradition of four instructors all working on the same painting. Sketching with a Brush Pen is one of many great free tutorials on YouTube by Scott Robertson. I’ll be sharing more tutorials from other artists on YouTube every Tuesday. Have you run out of ideas for your next blog post? EBSQ Tips for Awesome Art Blogs will feature some of the more creative posts our artists are taking advantage of to spice up their blogs. Whether you like them or not, videos are a popular way to share knowledge and entertainment on the web. More and more artists are cashing in on this growing fad, with how-to videos and time-lapse videos of their painting process. Videos can also be a great way to drive more traffic to your blog and through Youtube, introduce many more new potential buyers and fans to your art. Today’s video example is from EBSQ artist Melia Newman. You can see how she incorporated this video into her blog post here. You don’t need to buy top of the line, expensive equipment to begin recording in your studio. In fact, you may already have everything you need at your fingertips. Melia Newman made the above video using her web cam. Many new laptops are sold with web cam’s pre-installed. Then all you need is something like Windows Movie Maker (free) or Apple iMovie (free) for Mac users. Most any video editing software includes a simple upload to Youtube. Once on Youtube you can easily embed the video on your blog or website! 1. Keep your video under 5 minutes. This isn’t a strict rule, but it does make it easier for visitors to watch whenever and where ever they are without taking up too much of their time. 2. Make sure you have adequate lighting for your video too! A few EBSQ artists who have taken advantage of the “video” post include: Melia Newman (Blog), Robert Kimball (Blog), Mark Satchwill (Blog) and Noelle Hunt (Blog). Want to be featured in February’s Art Gallery Video? If you’re a regular reader of our blog, it’s likely you’ve already seen January’s video featuring our Still Life Art Gallery. (No? Check it out on both Vimeo and YouTube). Want to get in on the action for next month? 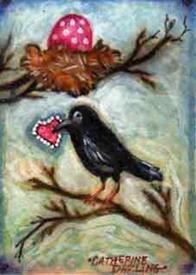 We’ll be featuring our Seasonal Gallery: Be Mine just in time for Valentine’s Day. To be considered, simply add your Valentine-related artwork to this gallery by 24 January 2010. Only family/work safe pieces will be selected, so keep it tasteful. Artists will be contacted starting 25 January 2010 and you’ll get to approve the finished video before it goes public. Looking forward to seeing your Valentine-themed art! A still life is a collection of inanimate objects — very often ordinary — depicted in an artistic composition. What a still life really *is* is a collection of bits of our life. The things we use, see and touch so frequently that we often overlook the beauty and appeal that they possess.